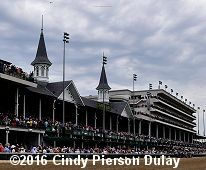 As the big day approaches, everyone starts to wonder what the weather will be like for the Kentucky Derby in Louisville, Kentucky. Here is a collection of various weather resources you can check and try to come to a consensus as to just what the weather will be like. Average and record high and low temperatures plus sunrise/sunset info. Also has a nice radar animation so you can see which way the rain is moving. 10 day advance forecast and local conditions. 15 day advance forecast. Just click the link after the 7th day and get days 8 through 15. This service supplies weather info to most of the newspapers. 10 day forecast and local conditions. Nice service with a 7 day advance forecast and a searchable archive of daily weather conditions for the past 6 years. 5 day forecast and local conditions.